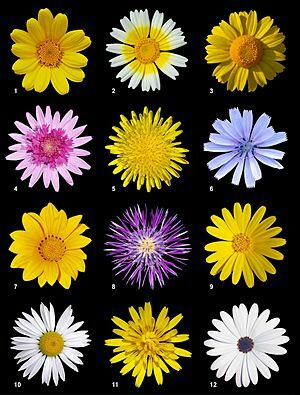 The family Asteraceae or Compositae (known as the aster, daisy, or sunflower family) is the largest family of flowering plants, in terms of number of species. They are distinguished by having flower heads (capitula) which are made of hundreds or thousands of tiny individual flowers. This is a pseudanthium ("false flower"). 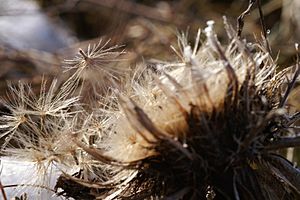 In plants of the family Asteraceae, what appears to be a single flower is actually a cluster of much smaller flowers. The overall appearance of the cluster, as a single flower, functions in attracting pollinators in the same way as the structure of an individual flower in some other plant families. 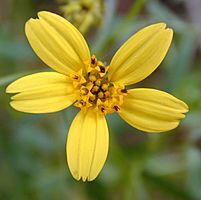 The older family name, Compositae, comes from the fact that what appears to be a single flower, is actually a composite of smaller flowers. 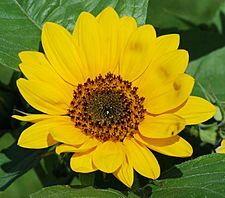 The "petals" or "sunrays" in a sunflower head are actually individual strap-shaped flowers called "ray flowers", and the "sun disk" is made of smaller circular shaped individual flowers called "disc flowers". 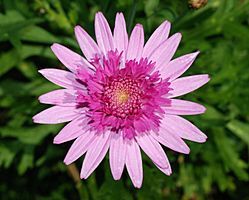 The word "aster" means "star" in Greek, referring to the appearance of some family members, as a "star" surrounded by "rays". The cluster of flowers that may appear to be a single flower, is called a head. The entire head may move tracking the sun, like a "smart" solar panel, which maximizes reflectivity of the whole unit and can thereby attract more pollinators. 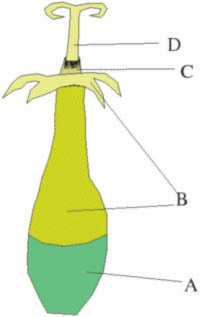 At the base of the head, and surrounding the flowers before opening, is a bundle of sepal-like bracts or scales called phyllaries, which together form the involucre that protects the individual flowers in the head before opening. The individual heads have the smaller individual flowers arranged on a round or dome-like structure called the receptacle. The flowers mature first at the outside, moving toward the center, with the youngest in the middle. Asteraceae Facts for Kids. Kiddle Encyclopedia.